Find out where they'll be shooting fireworks off nearest you in the Boston area in 2019 - alphabetically by town. Many towns around Boston celebrate on different dates & times - so you are sure to find a display to fit your schedule near you. While we have made every effort to confirm that each of these listings is correct, plans do change - especially for weather. Please check with local authorities or your town website to confirm dates & times. Happy Fourth of July 2019! If you're interested, sign up for our free weekly newsletter for a great list of Boston's family-friendly events. Amesbury 7/4/2018 10:00 PM Woodsom Farm – 223 Lions Mouth Rd. Dracut 6/28/2018 9:00PM School complex at Lakeview Ave.
Gloucester 7/3/2018 9:30 PM Fort Area – Stage Fort Park – 1 Hough Ave.
Groton< 7/7/2017 Dusk at the Town Field (behind the Groton Public Library). Monson	6/23/18	9:15 PM	Quarry Hill School – 43 Margaret St.
Pepperell	6/30/2018 9:30 PM	Nissitissit Middle School – Chase Ave.
Pittsfield	6/23/2018	Between 8:45 - 10:00 PM	Pittsfield Cemetery Property – 105 Wahconah St.
Pittsfield	7/4/2018	Between 8:45 - 10:00 PM	Pittsfield Cemetery Property – 105 Wahconah St.
Pittsfield	7/20/2018	Between 8:45 - 10:00 PM	Pittsfield Cemetery Property – 105 Wahconah St. If you know of a display that is not shown here - let us know! Be safe! 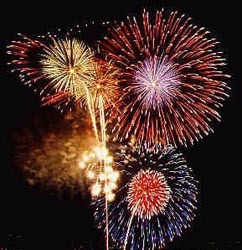 And enjoy the spectacular fireworks displays Massachusetts. You can also view this list of fireworks in MA by date. Sign up for our free weekly newsletter for a great list of family-friendly events to check out each week. Thanks you BostonCentral for putting this list together every year. I love that I can just go through and skim this list by town - that's unique. And then you also have a list that you can see by date! Super helpful! I just wanted to tell you that we appreciate it! !